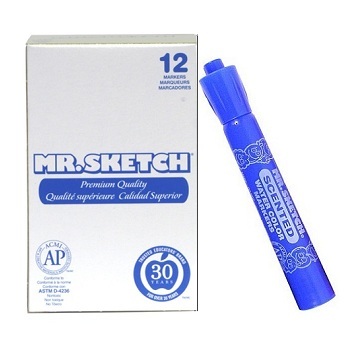 Mr Sketch is a premium quality brand of scented markers made by Sanford in the United States. First introduced in the early 1970's, Mr Sketch Markers remain extremely popular today with children, teachers and training professionals alike! 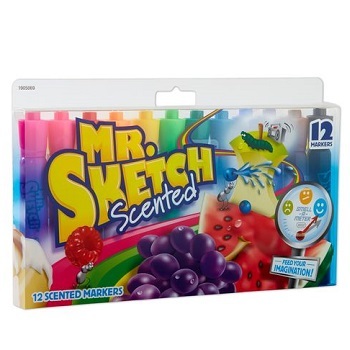 Mr Sketch Scented Markers offer fun, bright, non-toxic, water-based colours, each one with it's own fragrance, are safe and delightful to use. The broad chisel tips retain their shape even after months of use. Ideal as a non-penetrating flipchart marker, it will not bleed through paper. Ideal as a non-penetrating flip chart pad marker, will not bleed through paper. 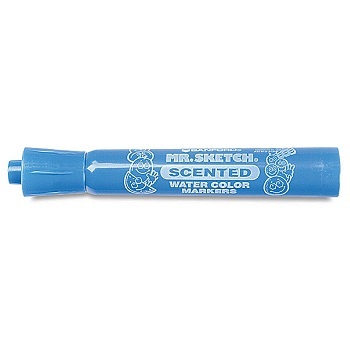 Fun, bright, non-toxic, water-based colours, each one with its own fragrance, are safe and delightful to use. 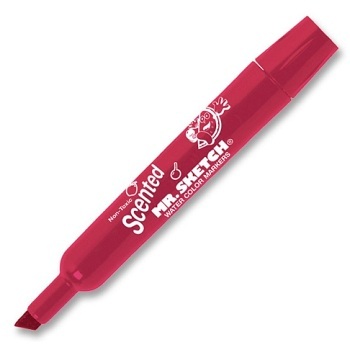 The broad chisel tips keep their shape even after months of use. Choose your colour and fragrance: Red/Wild Cherry, Blue/Blueberry, Green/Mint, Yellow/Lemon, Brown/Cinnamon, Purple/Grape, Orange/Orange, Pink/Melon, Turquoise/Mango, Magenta/Raspberry, and Dark Green/Apple. NOTE: Black/Licorice is not sold individually. Box of 12 markers per colour.